Teenagers sewed and packaged bandana pillows, and assembled teen kits filled with comfort items for teens and young adults with cancer and other life-threatening illnesses. Hundreds of teenagers from South Jersey took over Boscov’s court in the Voorhees Town Center for Martin Luther King Jr. Day of Service to volunteer with the Alicia Rose Victorious Foundation, whose mission is to raise awareness and provide strength and support for teens and young adults with cancer and other life-threatening illnesses. Teenagers sewed and packaged bandana pillows and assembled teen kits filled with items such as journals, playing cards and other comfort items in a custom ARVF backpack. Founder Gisele DiNatale, whose daughter Alicia’s death after battling cancer in 2002 inspired the foundation, said this was the biggest group they’ve had thus far. 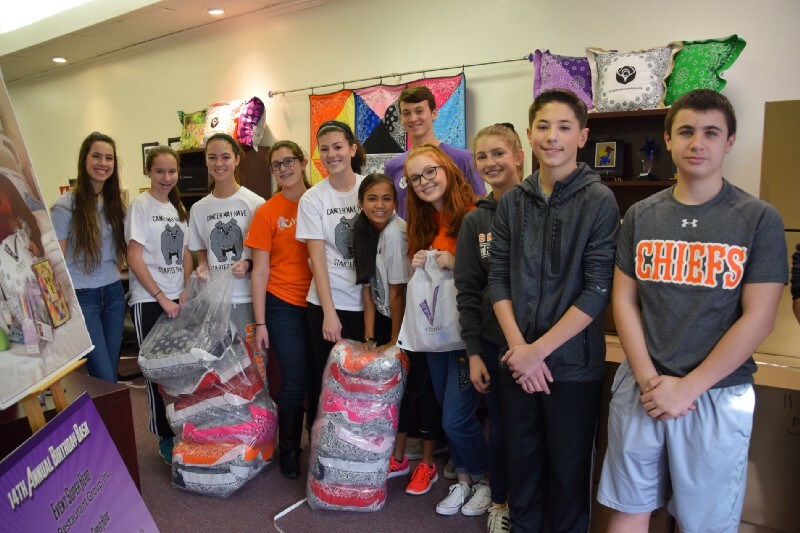 Haddonfield Memorial High School English teacher Kimberly Dickstein and her students volunteering with ARVF. Haddonfield Memorial High School English teacher Kimberly Dickstein, who’s also a member of the Board of Advisors for the foundation, brings her students every year and says they’re always eager to help, and they realize the impact they are having on other teenagers. It’s the fifth year the foundation has held a day of service on Martin Luther King Jr. Day, which is also the start of Teen Cancer Awareness Week. The dedicated third week in January was brought to fruition by Gisele, her husband Mario and Sen. Robert Menendez, and was unanimously approved by the U.S. Senate in 2012. The foundation has events planned for each day. On Tuesday and Wednesday, various schools in the area are hosting teen kit drives and bandana drives. Thursday afternoon, the foundation is unveiling its Victorious 4 Teens Art Cart program at Virtua Hospital, which are mobile carts the hospital staff is able to bring to each patient’s room. The foundation partnered with A.C. Moore, which provided the carts to give to teens that are isolated in their rooms or not well enough to get up and move around. 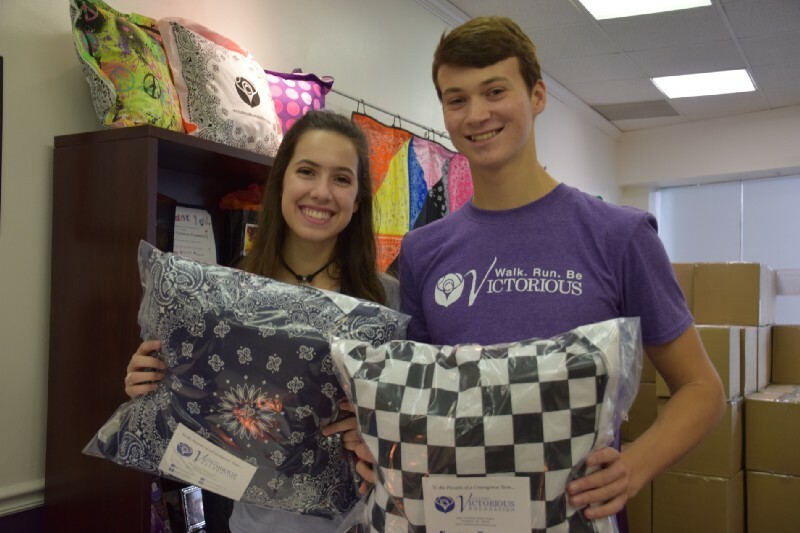 Victoria Penza and Mac VanBushkirk helped pack bandana pillows to be shipped to teens and young adults in local hospitals. Also on Thursday, a Dine and Donate event will take place at all five South Jersey P.J. Whelihan’s locations, which will donate 15 percent of each meal purchased from 5 p.m. to close directly to the foundation. You must mention you are with the Alicia Rose Victorious Foundation to your server. Lastly, Shop for a Cause will take place Friday from 6 to 9 p.m. at Finally The Perfect Gift, a clothing and gift boutique located at 2038 Route 70 in Cherry Hill. Refreshments and wine will be served, and 15 percent of the proceeds will go directly towards the foundation. Teen Cancer Awareness Week is one of the busiest and rewarding weeks for the foundation, and DiNatale couldn’t be more grateful for the teenagers’ time and effort year after year. Source article published here by The Voorhees Sun.